If you don’t know what to buy in Guatemala, don’t worry, we are going to summarise the most typical souvenirs of the country. From brightly coloured fabrics, to Arabian quality coffee and Guatemalan rum. Everything in this country is exotic and tasty, so you will definitely buy more than one gift as a souvenir. Of everything you can buy in Guatemala, the best thing is to take some of the typical products home as a souvenir. Amongst these, there is one essential thing that everyone drinks and has made the leap to social networks: Zacapa rum. This aged rum from Guatemala is one of the best known typical Guatemalan products, and all of its flavour is made at more than 2,300 metres of altitude in Quetzaltenango. 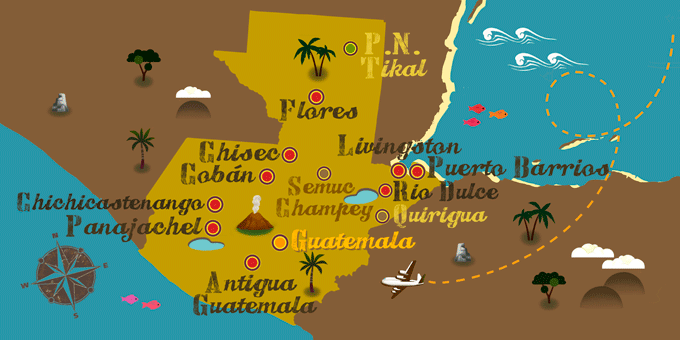 In this region, more than four types of Zacapa rum are made, the most sought after and valued. Zacapa rum 23 is a mix of various 6 to 23 year old rums whose main ingredient is caramel. As well as this touch of caramel, it also contains various spices and fruits which help to give it flavour in its ageing process. The Zacapa Edición Negra is another variant, this time with rums aged up to 24 years, which gives a smoky flavour. Chocolate and dried fruits are added to this characteristic flavour. If you like rum, this could be the perfect gift to buy in Guatemala. The Zacapa Xo, a mix of different rums aged between 6 and 25 years in French oak barrels. It is a gourmet rum with a spicy and fruity flavour. Its age is perfect, and its aroma is unforgettable to the most discerning palate. The last example is the Zacapa Royal, made with a mix of rums aged up to 30 years. The King of rums, aged in exclusive barrels and distilled with citric and caramel notes. A delicate and perfect rum for connoisseurs of this drink. Another of the typical Guatemalan products is Quetzalteca, an aguardiente (fire water) of different flavours. It can be tamarind or hibiscus flavour and has started to be sold in all of the country’s shops and around the world. It is also available in its original version without added flavours, in any case, it is a symbol of the country. This liquor has been made since 1937 and has also been linked to daily life and customs of the locals. It is so popular that it is sold in a pocket sized bottle, although there are also other sizes. You will recognise it by the indigenous woman who decorates the label, which is why it’s called Indita. If you are still unsure of what to buy in Guatemala, or you're not into liquors, coffee is the perfect choice. This coffee is considered one of the best in the world and has been made since 1760. Is aroma, acidity and body are due to the fact it is grown at high altitude and dried in the sun. Guatemalan coffee requires a lot of time to process it, everything is done manually. One of the most famous varieties is the Volcán de Oro Coffee, grown at 1600 metres, which has a very high quality. Other known brands include Café León, Café Isabel and Café Capeuleu, these three are exported around the world. The second is dedicated to the high quality Arabian variety, and the last is a gourmet coffee. Now you have the perfect souvenir from Guatemala to take home or to surprise one of your friends as a gift. But leaving to one side the products that can be drunk, there are more things to buy in Guatemala. 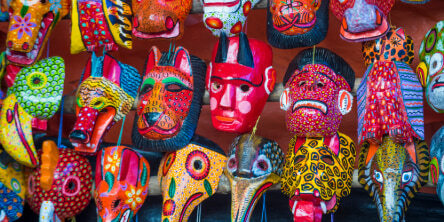 The most exotic thing to buy in Guatemala are ceremonial masks made by indigenous people. These masks are usually used in rituals, dances and religious ceremonies. They are made of bright colours and show different expressions of animals or humans. In general, they are made of pine and are a great lure for tourists. Guatemalan masks, far from disguising the person wearing them, have the task of transforming their wearer into the character they are wearing. Whether it’s a goddess, angel or animal, the person wearing the mask takes on the role it represents. This way they fully enter a new world that they want to get to know and/or express. The jade mines of Guatemala supply the country's jewellers to make extremely beautiful necklaces and rings. There are many companies who export jade to the rest of the world from Guatemala. This green coloured precious stone is highly valued in jewellery for its beauty and durability. Jade is resistant to knocks, and the most widely sold in Guatemala is a type of jade known as jadeite. This jade is characterised for not being as shiny as nephrite jade, but it has a wider variety of shades. In addition, for the Mayas, jade was always very valuable, even more so than gold. Its extreme hardness was a symbol of immortality for them. They also attributed special powers of fertility and life to it as well as therapeutic powers. You can buy a necklace, ring, or a figure made of jade with a special meaning to give someone as a gift. This is undoubtedly one of the best souvenirs of Guatemala that you can find as s souvenir of your trip. In addition to all of the things that you can buy in Guatemala mentioned above, you also have multicoloured fabrics that can be used to make scarves, cushion covers, rugs, quilts and much more. Leave space in your suitcase and fill it with memorable souvenirs form this beautiful South American country.